The overprotective clownfish, Marlin, has taught his son to be careful of the dangers outside their anemone. The Finding Nemo Series 2 Mini Cell features Marlin and Nemo together at home, before they are whisked off on an adventure that will take them far from the reef. 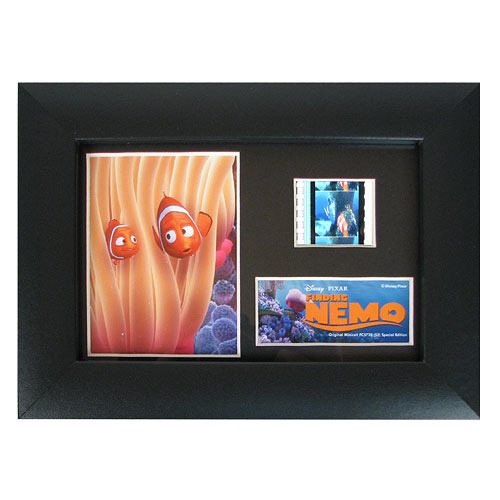 Own a piece of Disney Pixar history and relive your favorite moments from the hit movie Finding Nemo. Measures 7 1/2-inches wide x 5 1/2-inches tall. Perfect for displaying in your home or at the office, all the elements are framed in black wood and includes a certificate of authenticity. Ages 15 and up.